We grew into the job. 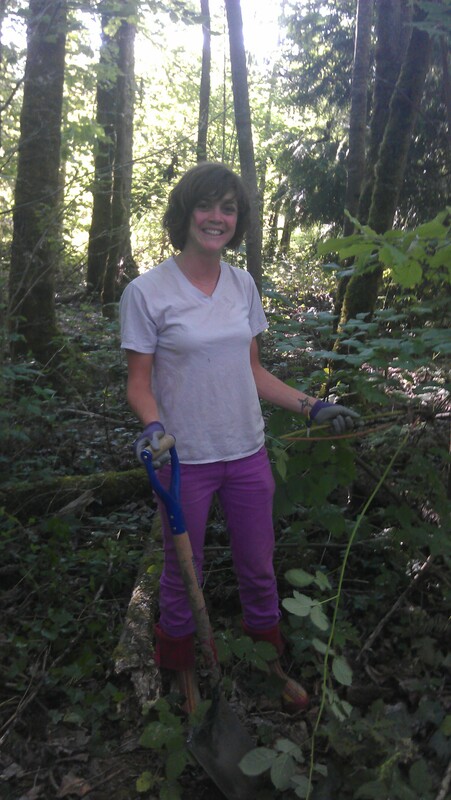 Our HandsOn Teamworks team was supposed to pull out the invasive ivy and blackberries from a small part of Oaks Bottom Wildlife Refuge, a 140 acre wilderness retreat inside the city on the east banks of the Willamette River in Portland. The refuge was the first of it’s kind in Portland, but it almost wasn’t. At the time, the city used it as a dumping ground for interstate construction debris. The plan was to fill in the rest then put in a motocross track until local chapters of the Audubon Society and the Nature Conservancy, along with local residents, voiced their opposition. The groups’ efforts were successful. The wetland fill was stopped and a home for 185 kinds of birds was born. I asked her if she felt daunted by the sheer size of the park, and the time it takes to get rid of the invasive plants using only volunteer help. After all, for all our Teamworks’ efforts, we only cleaned up a small area of the forest. “I don’t focus on the entire refuge,” again paraphrasing what Marissa said, “when I’m removing invasive plants. I only focus on one small area at a time.” That’s a great attitude. Just because we can’t do everything, doesn’t mean we can’t do something. What Marissa didn’t say, but became apparent to me as the group walked out after 2 hours of work, was that the refuge isn’t like building a building or completing a project. There really is no beginning, middle, or end. No timeline can capture the duration of a forest. It’s a project that continues for generations, with each generation of volunteers contributing and learning what it can, then passing it on to the next. Each project is just a part of the larger whole, bettering, but not completing the forest. A very apropos sign on the way home. Life is like that. We set goals and finish projects. We earn degrees and awards. We start and end careers. We make friends and build families. Throughout it all is growth. Like a tree, growth continues unabated. No project ever defines a life, no task ever completes it. Every event, no matter how seemingly insignificant or grandiose is a small bit of growth, like a leaf or a branch. And when we’re done, what we’ve left behind is the wisdom, love, and knowledge that we’ve learned, all for a new generation who will become the stewards of our gifts. Yesterday’s gift of time … With our Hands On Portland Teamworks team, we removed invasive ivy and blackberries from a small section of Oaks Bottom Wildlife Refuge. I think we all grew a little bit. 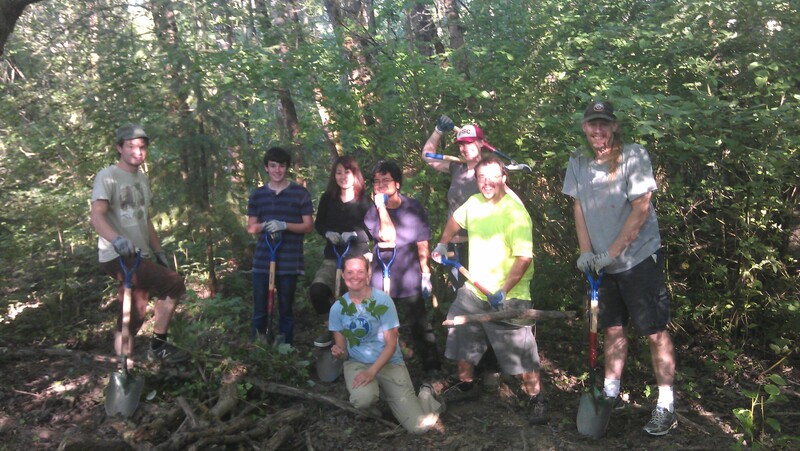 This entry was posted in In the community and tagged English Ivy, environment, give time, giving time, Hands On Portland, invasive species, Oaks Bottom, Oaks Bottom Wildlife Refuge, Portland Parks and Rec, Portland Parks and Recreation, Teamworks, Volunteering. Bookmark the permalink. 6 Responses to Don’t Go Through Life. 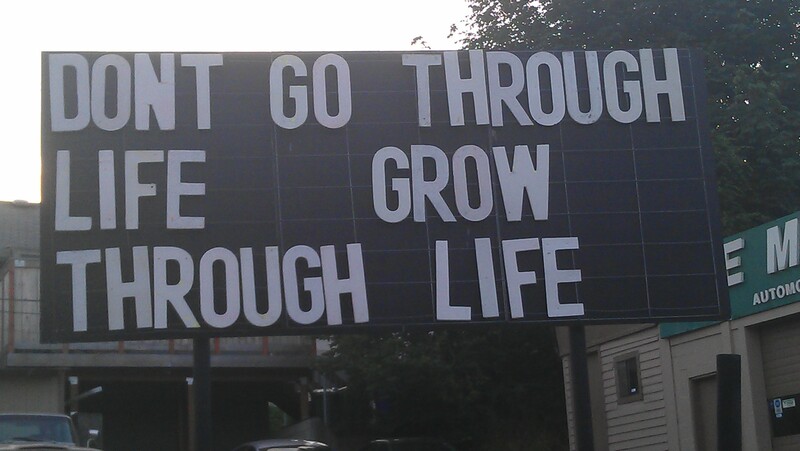 Grow Through Life. Yes, of course you can quote and link back to my site. I’m honored you liked them, and hope they give a little inspiration to your readers. It’s a pleasure to meet you and thanks for stopping by!